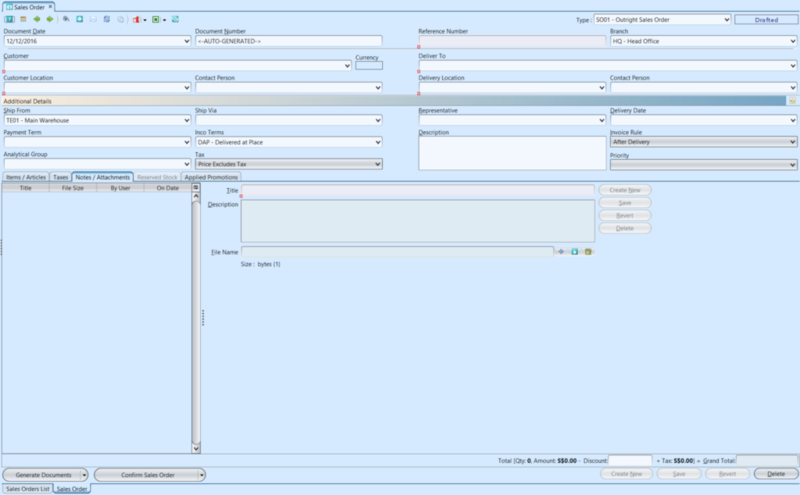 Sales Order view allows user to create and manage sales order documents. Delivery Date The final date by which the underlying commodity for a futures contract must be delivered in order for the terms of the contract to be fulfilled. Products can only be entered when information in the top part (header) of the document has been properly entered. The credit check functionality will only be available when all the top part fields have been entered and the save button pressed. The system will check whether any UOM Conversion is needed for the ordered product(s). If so the system will generate UOM Conversion document, with list of product(s) to be converted, for user to process first to fulfill the Sales Order. 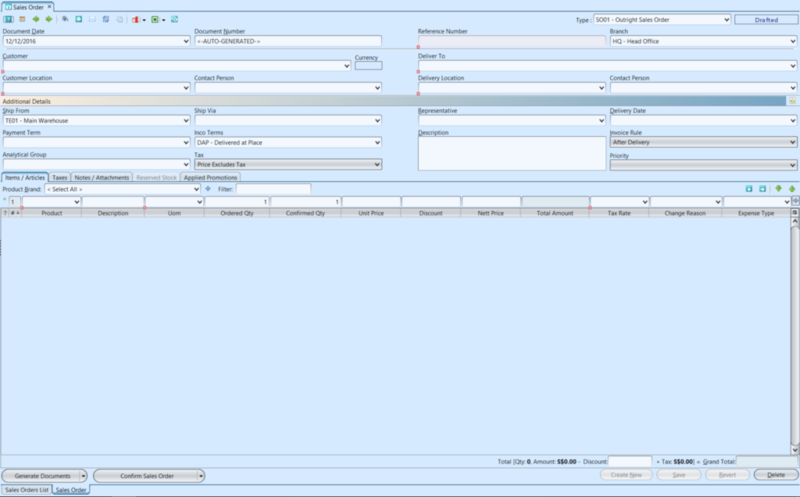 After the UOM Conversion process is successfully completed, user to confirm the Sales Order document again. Optional: User may change the Reserved Stock for a particular product to a different batch if they wish to do so, after the Sales Order confirmation. On the “Reserved Stock” tab, click “Modify Batch#” button. It will open a window for user to select a different batch for ordered product. Click on a batch # from the list and press ENTER. Click OK button to commit the change. The selection of batch / lot of products are based on the Picking Method as set in the Product master. For example, FEFO (First Expired First Out) method will reserve expiring product batch / lot first. 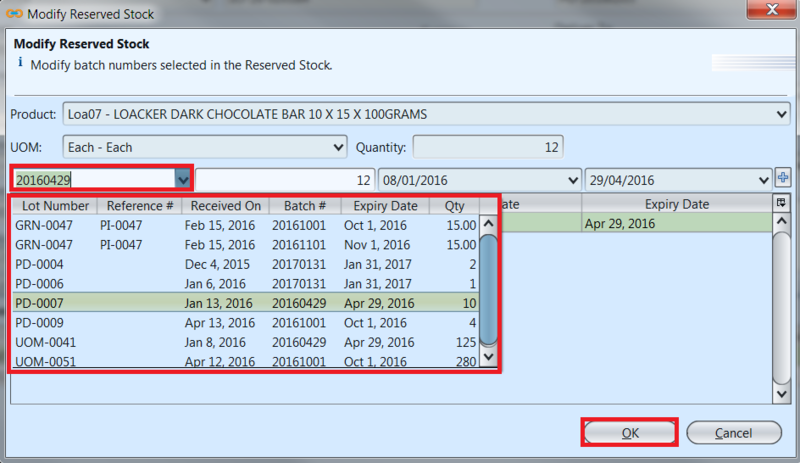 If expiry date was not entered for a product batch, but there is Shelf Life (In Days) defined in the Product master, system will calculate the product’s expiry date based on the Received On / Manufacturing Date plus shelf life and then reserve the first expiring product for the Sales Order. 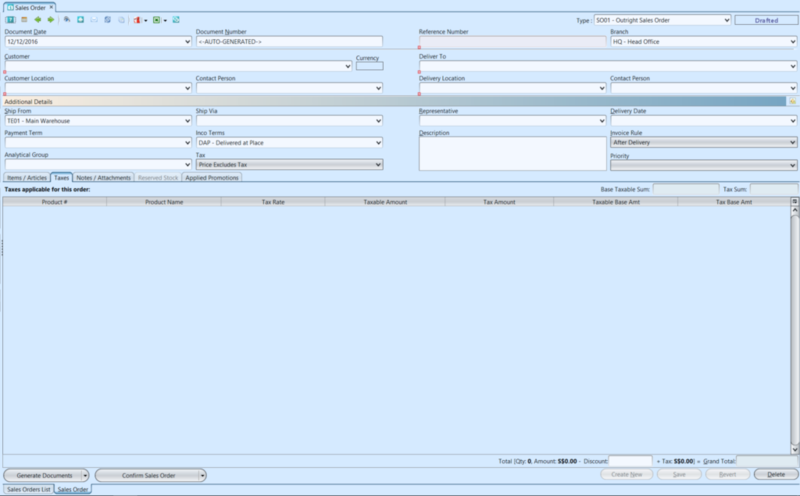 The system will automatically check if there is any promotion(s) applied for the customer for the period of the created Sales Order document date. If so, the promotion(s) will be displayed in the “Applied Promotions” tab, and any free gift / discount added in the “Items / Articles” tab. 12. 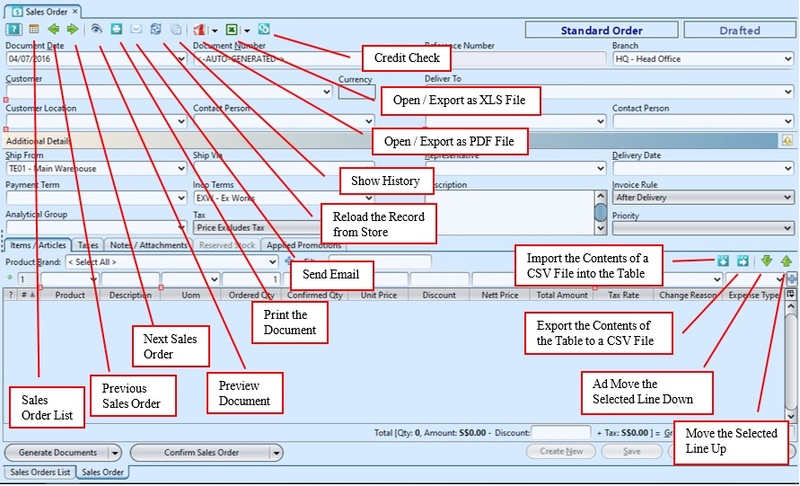 If ”After Delivery” invoice rule was chosen, a link to “Delivery Order” transaction (Inventory module – Outbound) will be created at the bottom left of screen to process delivery order for the sales order. 1. Click on “Sales Orders List” tab at the bottom of screen. At many places within Samooha, user will see these 2 buttons which indicate that user is able to import / export data from / to CSV (comma-separated values) file for that document view. Data in CSV file can be viewed using Excel or Notepad program. Click on “Sales Orders List” tab at the bottom of screen. 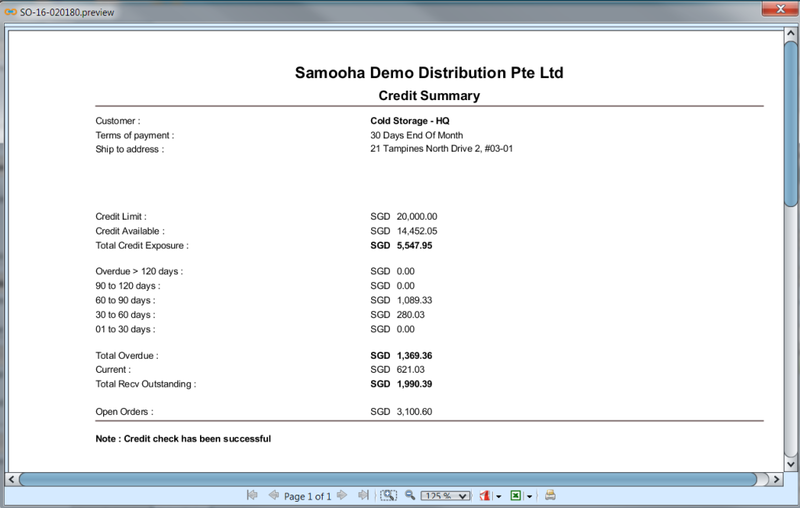 At the top right of screen there are 2 buttons; button to export approved Sales Order documents as CSV file, while button to import CSV file into Samooha as drafted Sales Order documents. 3. 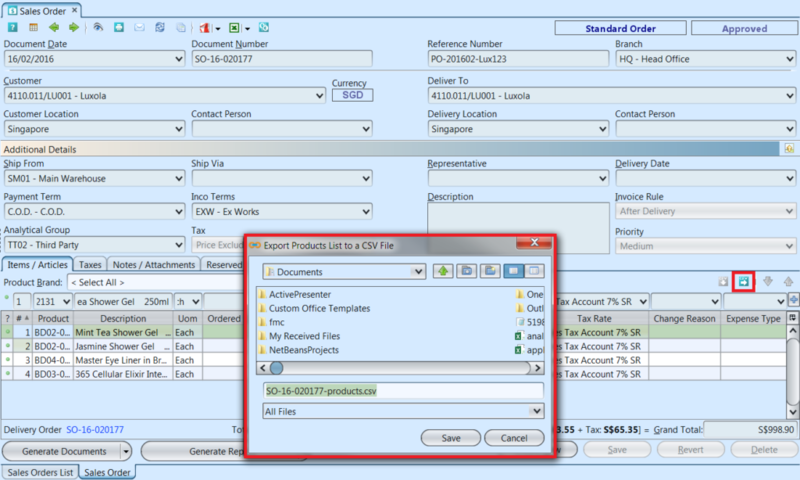 Click OK button to confirm and export the selected Sales Order document(s) to CSV file. 1. 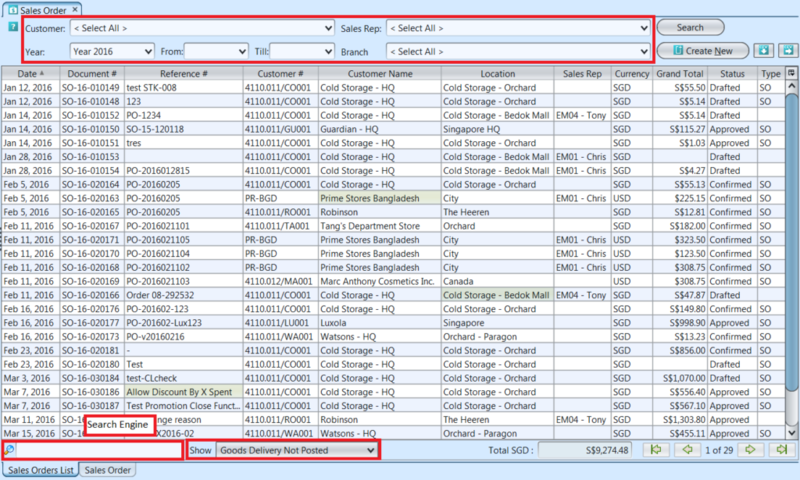 To import sales order, click button in the Sales Order list view. 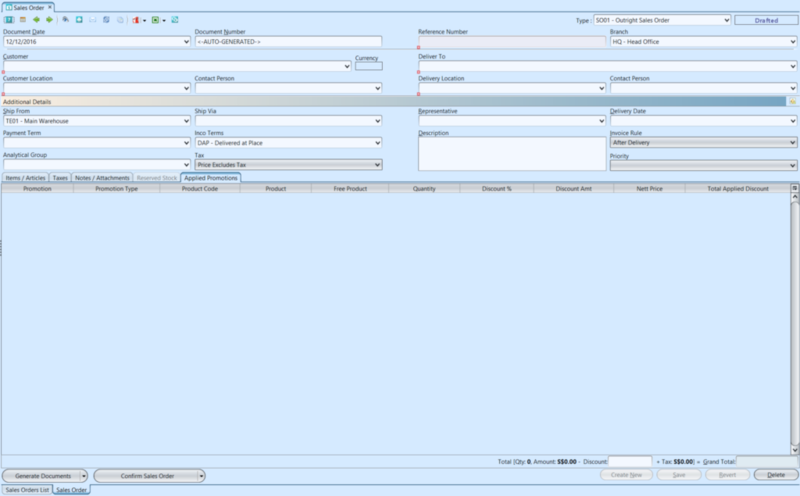 User can import multiple Sales Order documents in a single CSV file. Sales Order document will be imported into Samooha as drafted in status. 3. 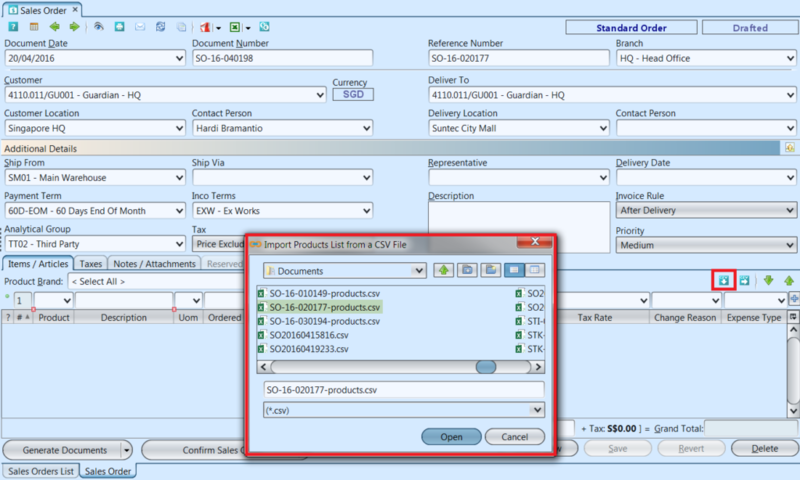 Click OK button to confirm and import the selected CSV file as Sales Order document(s). 4. Click Search button on top right of the list view to refresh the list. If successfully imported, the document(s) status will be shown as drafted. 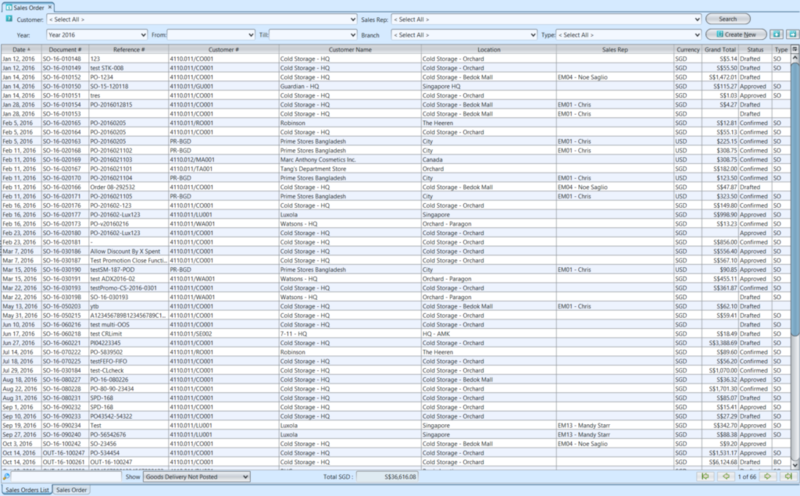 In Sales Order view, user is able to export list of products in the sales order or import list of products to be part of the sales order. 2. Double click on a sales order from the sales orders list, it will bring up the details on “Sales Order” tab for the selected order.